Carbon features a lot in materials science news. It features a lot in chemistry, biology and many other areas of research too. But, organic molecules and molecular biology aside, it seems that it is when carbon is spherical, wrapped up in cylindrical tubes, or laid out flat in graphene monolayers that it gets the most publicity. So, forgive me for waxing lyrical about element number 6 once again, but I just got wind of another allotrope to add to the carbon list alongside diamond, fullerenes, nanotubes, graphene etc. 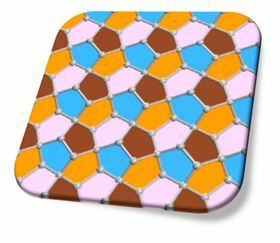 This time, a collaboration between teams in China, Japan and the USA, has discovered penta-graphene, which as you might guess from their name for the material, resembles graphene but instead of being a flat sheet of hexagonally related carbon atoms it is a somewhat lumpy sheet of pentagons. [Wang et al, 2015, Proc Natl Acad Sci; DOI: 10.1073/pnas.1416591112] Lumpy because you simply cannot tessellate pentagons and so there is some steric strain among the carbons that cause distortions to produce what the discoverer of the material, team leader Qian Wang (of both Peking University, in Beijing and Virginia Commonwealth University, Richmond, USA) refers to as a "quasi-2D sheet with a bulking height of 0.6 angstroms". It resembles the "Cairo pentagonal tiling", a dual semiregular tiling pattern used to pave the streets of the Egyptian capital city centuries ago. "Carbon is an amazing material showing many faces [pardon the pun] - from graphite to graphene, nanotubes, and fullerenes where hexagons are the basic building blocks," Wang told me. "With the exception of fullerene, carbon structures made exclusively of pentagons are not known." I was intrigued to say the least, but wondered whether this material, quasi or otherwise, may nevertheless be less than stable shall we say. "It is energetically metastable compared to graphene and graphyne," Wang told me, "but it is more stable than some nanoporous carbon structures like the 2D (3,12)-carbon sheet and alpha-graphyne, and it is energetically favorable over the experimentally identified C20." In their paper in Proceedings of the National Academy of Sciences, Wang and colleagues predict using various state-of-the-art theoretical calculations that there should exist an all-pentagon nanosheet, penta-graphene, that is dynamically, thermally and mechanically stable. Penta-graphene the team reports will have several unusual properties such as a negative Poisson ratio, a large band gap and an ultra-high ideal strength that might even outperform graphene. More interestingly, penta-graphene can be rolled up to form a one-dimensional pentagon-based nanotube that is semiconducting regardless of its chirality, which is not the case with conventional carbon nanotubes. It can also be stacked to form three-dimensional stable twin structures of T12-carbon that have band gaps even larger than that of T12-carbon. "The versatility of penta-graphene and its derivatives are expected to have broad applications in nanoelectronics and nanomechanics," Wang added. Well, as with many pronouncements we will just have to wait and see. We have had uses for diamonds and graphite for millennia, applications of other allotropes are slow burners. Maybe the idea of the streets being paved with carbon is not so attractive as gold, but pentagonal tiles could well lead the way to new devices and engineering materials.